One of the best ways to find a financial institution is to look in the vicinity of your home or office for easy access or ask a friend for a recommendation. Other than that, there are online tools like Nerdwallet where you can search by zip code to choose a checking account, savings account or certificate of deposit (CD) rates. Always check the financial institution’s website for more up-to-date information. Many financial institutions can help you manage your money conveniently, while keeping your money safe. Financial institutions offer numerous low-cost financial products and services. *This list is not exhaustive. Nevertheless, these are the financial institutions that have either 2nd chance or restorative checking or saving account options. As you shop for a bank account or prepaid card, be sure to read the fine print and ask questions. Do you have to use direct deposit, maintain a minimum balance or meet some other condition to avoid monthly fees? Do additional services like bill payments and overdraft protection have additional fees? Nerdwallet published a blog about second chance accounts with some good information as well as a search function by state. Savings Accounts: Many financial institutions have health savings, youth savings, Christmas savings and other specialized accounts. Money in a savings account can be accessed when needed. Checking Accounts: A checking account is a deposit account held at a financial institution that allows for withdrawals and deposits. Money can be withdrawn using checks, automated cash machines and electronic debits, among other methods. Certificates of Deposit (CD): A CD often offers the highest interest of any savings option, if you don’t mind leaving your money alone for a longer period of time – from several months to several years. Individual Retirement Accounts (IRAs): An investing tool used by individuals to earn and earmark funds for retirement savings. There are Traditional IRAs and Roth IRAs. To find out more about IRAs, check out the IRS website. Money Market Accounts: An interest-bearing account that typically pays a higher interest rate than a savings account, and provides the account holder with limited check-writing ability. Investopia has some great information about money market accounts. Prepaid Cards: Prepaid debit cards are re-loadable cards that allow you to only spend up to the amount you have pre-deposited into the account. Check out the types of cards available and the advantages and features of prepaid cards from Practical Money Skills. Certain fees and restrictions may apply, so it’s important to read the card’s terms and conditions carefully. Practical Money Skills has some great advice on questions to ask before opening an account. 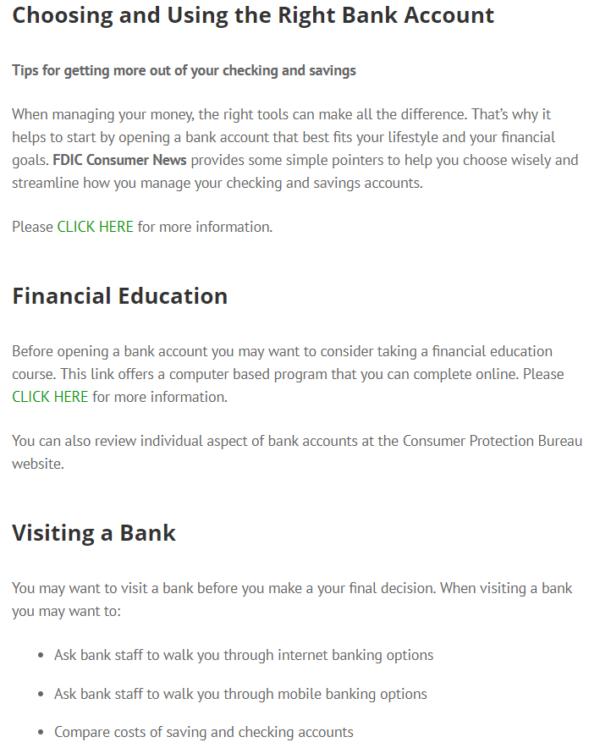 Nerdwallet shows how to open a bank account and what you’ll need to open it. Balancing Your Checkbook – Keeping track of all your transactions is very important and only takes a few seconds and can save you costly overdraft fees. Don’t forget to balance your checkbook every month. Check out these tips on how to balance your checkbook from Nerdwallet and Practical Money Skills. Advice on managing your account from Investopedia. Understanding Overdraft Protection – Overdraft protection is a service offered by banks that allows checking account holders to temporarily make purchases with a debit card even if they don’t have sufficient funds in their account to cover them. There is usually a fee charged for each transaction to use the service. Investopia and About Money explain overdraft protection. Checking Account History – It’s not a given that anyone can open a regular checking account. Making mistakes with a bank account, such as not paying overdraft fees, can put you on a list to let other banks know you’re a risky customer, and you might be denied an account because of it. Fortunately, some banks and credit unions offer second chance checking accounts to help people rebuild their credit and financial histories. Tip: If you can’t record when you make a purchase, keep the receipts together and record later. Mobile Banking – Check balances, transfer funds, pay bills, and deposit checks from anywhere (Please check out the Mobile Finances tab for more). Please check with your local institution and discover the many services they offer and the charges associated with those services.